"The Night The Lights Went Out On Wall Street"
"101 Things To Do With A Dead President"
"Well, I Guess I Am That Kind of Boy"
The team finds itself at the mercy of the conniving and power-hungry Princess Zanda. Based on an old George Perez THUNDER Agents cover, this piece features the powerful pencils of Khoi Pham and the incredible inks of Bob Almond. Note: Princess Zanda was a character created by the late, great Jack Kirby, and she debuted during Kirby's BLACK PANTHER series of the 1970s. This ad from Wally Wood's T.H.U.N.D.E.R. 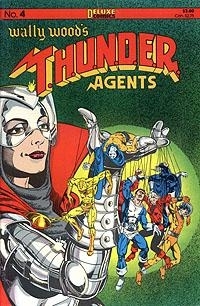 Agents #4 for Rich Buckler's How To Draw Super-Heroes says that George provided an "Afterward" for the book. While I don't have a copy of the 'How To' book, I don't think George contributed to it.